What makes PNC Park so good? The Clemente Wall: 13 feet high? It could have been had a rookie outfielder named Earl Smith hit the first month of the 1955 season as he’d hit in spring training. That year opened with Smith wearing No. 21 and fellow rookie Roberto Clemente wearing 13. How the numerology of Pirates history might have been different had Smith displayed any of the form that helped him hit 32 homers and drive in 195 runs the season before for Phoenix in the Arizona-Texas League. But Smith went 1 for 16 with no runs batted in in his first five games. The Pirates started 2-11. On May 3, general manager Branch Rickey sent Smith to the minor leagues from where he never returned. Soon thereafter, Clemente switched to 21, the number he bore all the way to Cooperstown and a spot in the eternal fabric of the franchise. On such insignificant transactions does history often turn. After 129 seasons, 10,000 games, five ballparks and more than a half-dozen generations of Pirates fans, back stories such as Smith, Clemente hide everywhere in plain sight. We walk past them and in some cases over them every day. We see them without seeing them. Seasons pass and we forget we even knew them. But they endure, just below the surface and just beyond the itch of curiosity. We know why PNC architects made the right-feld wall 21 feet high. But why was Clemente so quick to take the number when the chance presented itself that spring of 1955? Twenty-one letters: the number it takes to spell Roberto Clemente Walker. Clemente’s honors throughout the world are many. But the fact that he has a bridge named in his honor — the best way into PNC Park on game days — is as rare as most any non-baseball honor accorded a player. The former Sixth Street Bridge is one of only two in the United States to be named after a baseball player, according to Baseball-Reference.com. The other is for a longtime Pacific Coast League manager named Lefty O’Doul and stretches across McCovey Cove outside AT&T Park in San Francisco. When Forbes Field was wrecking-balled in 1970, home plate was preserved and placed in the floor of Wesley W. Posvar Hall — one of the buildings on the Pitt campus that sprang up over the Old Lady of Schenley Park. It was reputed to be encased on the spot where home plate was from 1909-70. Two reports have since challenged that claim. One alleged that if the plate had been placed in its exact location, it would have been not in a main public area as it is, but in the fifth stall of a first-floor women’s restroom. An amusing claim, but one that has mostly been written off to urban myth. A more likely challenge came in 2010 from Dan Bonk and Leonard Martin, co-authors of “Build It Yourself Forbes Field.” After studying the stadium’s plot plan and the 1973 blueprint of Posvar Hall, they determined the original home plate location to be just outside the school’s economics library — 81 feet from its Lucite-encased tribute. Over the past several decades, Hemingway’s Café has become a popular way station on the fringes of Pitt’s main campus. For the informed fan, though, a walk through its doors can also be a trip back to that time when Forbes Field was the epicenter of the Pirates’ universe and a 1940s fan favorite named Frankie Gustine had a table or bar stool waiting just for you three blocks from home plate. From 1951-82, 3911 Forbes Ave. in Oakland was home to Frankie Gustine’s Restaurant, a gameday destination for players, sportswriters and fans and arguably a memorable Pirates landmark now largely buried under time. Thousands of Downtown commuters pass by it every day. Yet how many know it’s there? How many have stopped to look at it there on the wall of the underpass where Ross Street passes under the Boulevard of the Allies. There, a mural has hung since April 2000, larger than life, yet almost inaccessible in the middle of a busy intersection. It is The Legends of Pittsburgh, painted by Michael Malle and honoring the 14 greatest figures in the history of Pittsburgh baseball. 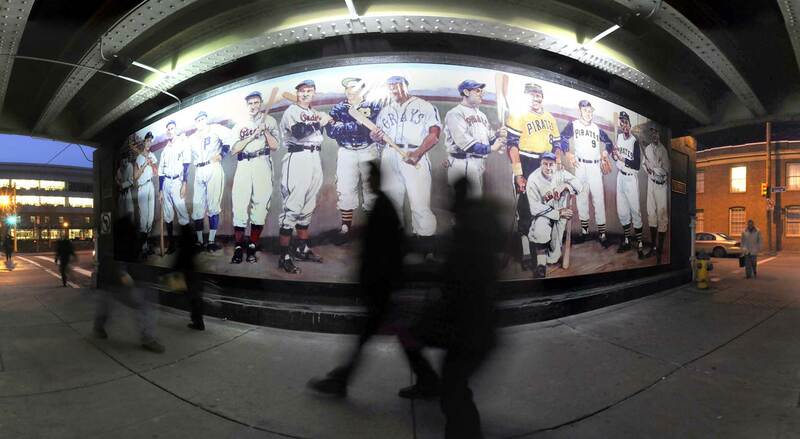 From Wagner to Clemente, they are timelessly painted against a vivid Forbes Field and into a time capsule of the imagination. Larger than life, yet, likely too often unnoticed on the way to and from the office. The Honus Wagner statue has been a part of the Pirates gameday experience since it was dedicated April 30, 1955, outside Forbes Field. It moved with the Pirates to Three Rivers Stadium and then to PNC Park, and through all the years and each move, it contained an unseen bit of Pittsburgh history. Encased within its base is the name of every individual, organization and foundation that contributed 50 cents, a dollar or 100 to its $50,000 price tag; each name inscribed on one long, continuous scroll and sealed in a steel tube — a roll call of Pirates fans of another time to this. Oh say, can you see? Well beyond PNC Park’s left-center field fence there is a windowed security building on the outfield concourse. If this were another ballpark, there might be a marker on it. But there is no designation. There is only a number in the media guide, some scattered memories and an enduring awe. It was against this building near the three flagpoles that Chicago Cubs slugger Sammy Sosa on April 12, 2002, hit the longest home run in the 15-year history of PNC Park. Generally, when fans think of long balls there, they think of right field and river splashdowns. But on that Friday night, Sosa turned on a 3-0 fastball from pitcher Dave Williams and hit it farther than any ball before or since — over the North Side Notch, over both bullpens and to the left of the batter’s eye before ricocheting off that security post — 484 feet from the point where bat met ball. “I didn’t think it was ever going to come down” said Pirates manager Lloyd McClendon. Among the five longest home runs hit in park history, it remains the only one hit to left. It is an oft-asked question. Ten numbers adorn the ribbon of PNC Park façade that salutes the men who have had their numbers retired by the Pirates. One never seems to belong. More than 60 years after he last wore his No. 1, the question is asked more than ever: Who is Billy Meyer and why does he belong? The answers are equally perplexing. 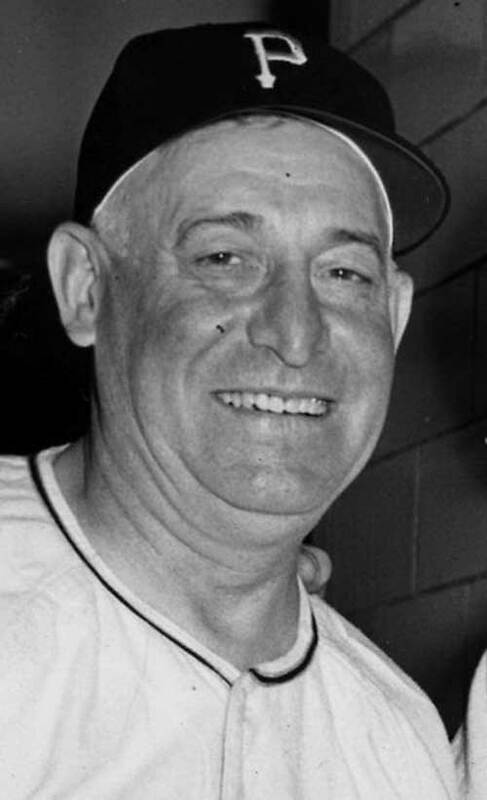 Meyer managed the Pirates from 1948-52 and oversaw some of the worst baseball in Pirates history, going 317-452, including the 112-loss edition of 1952 that finished a remarkable 541 2 games out of first place. Yet, his number resides for all time among Wagner, Waner and The Great One. According to a Pirates spokesman, it is because “he was a fan favorite … and because of his service … and his good human relations.” Apparently Leo Durocher was wrong: Nice guys don’t always finish last. In a parking lot on the North Shore between PNC Park and Heinz Field – a dingy-gray expanse of concrete framed by General Robinson Street to the north, Tony Dorsett Drive to the east, Chuck Noll Way to the west and a new office and retail building to the south that includes the editorial offices of the Pittsburgh Post-Gazette – is a splash of bright yellow painted in the shape of a home plate. While it is easy to ignore it as residue of a tailgate Whiffleball game, it is actually residue of profound Pirates history. The parking lot sits on much of the land where long-forgotten Exposition Park – the Pirates’ home from 1891-1909 – once stood and the spray-painted home plate on the spot where its home plate was more than a century ago. As an artistic backdrop to the Bill Mazeroski statue outside PNC Park’s right-field gate are three banks of red brick in homage to the wall over which Maz’s World Series-ending home run sailed in 1960. They are dutiful replications of that old wall. Well, two of them, anyway. The one on the left and the one on the right are aesthetic creations. But the one in the middle? Hidden there in plain sight is the actual “406” section from the left-center field wall over which history was made Oct. 13, 1960. When Forbes Field was brought down and Three Rivers Stadium built, it became an accent in the stadium’s Allegheny Club. When Three Rivers came down, the section returned to the Pirates, who then had it included in the statue dedicated in 2010 commemorating the greatest moment in Pittsburgh sports history.